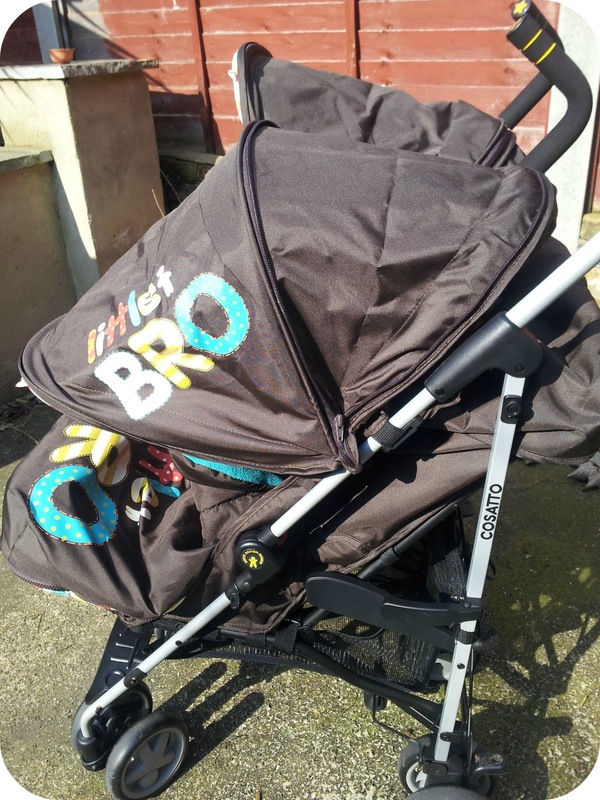 Having two children under twenty months, a double buggy is inevitable and as part of my role as Cosatto Brand Buddy, we have been reviewing their new Supa Dupa double stroller. The Supa Dupa was super easy to put together and comes complete with two newborn headhuggers, two foot muffs, two insulated bottle holders, a cup holder and a raincover. We chose the Big Bro, Little Bro design and it was love at first sight. 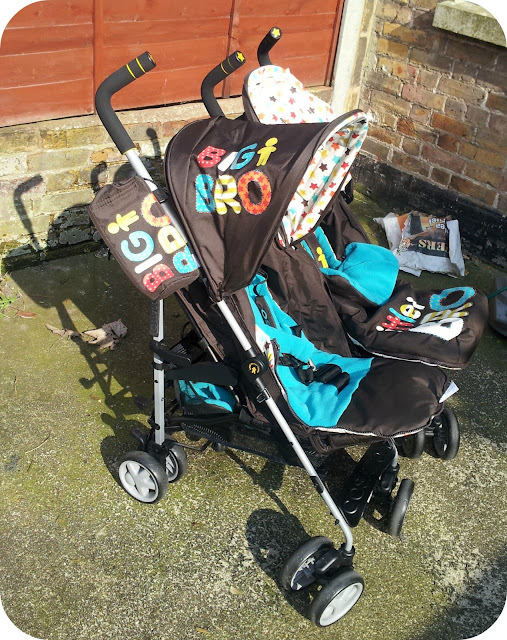 The pushchair is colourful and bold without being too bright and I loved the colour scheme. 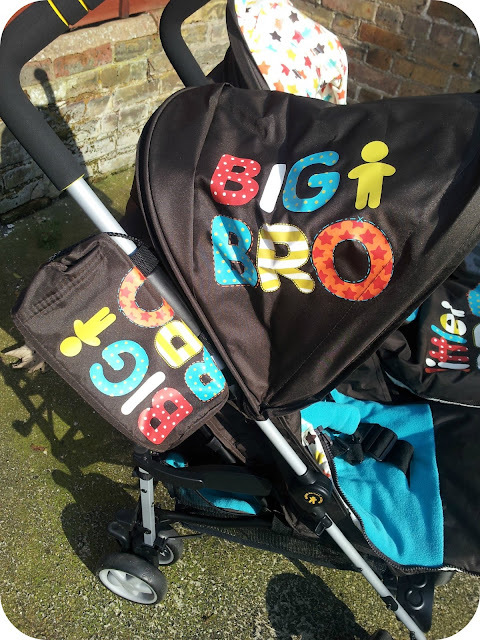 I think the design is great for slightly older children as they really take on the role as 'big bro' and the fact that both sides are clearly marked means no readjusting the straps each time! 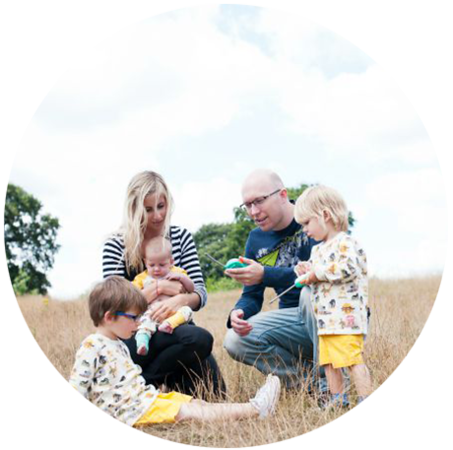 The stroller is an umbrella fold which means it is perfect for getting out and about and easily fits in most boots. It is very easy to put up and take down with a simple pull of the ring and a push down on the lever. When folded it is held together with a small clip on both sides and stands up on its own - perfect for storage! I found the stroller nice and easy to push and not much heavier than pushing a single, although I did notice it was harder to get up a curb than our single Cosatto stroller. I could push one handed using the middle handle quite easily although I prefer to use the two height adjustable handles on either side. 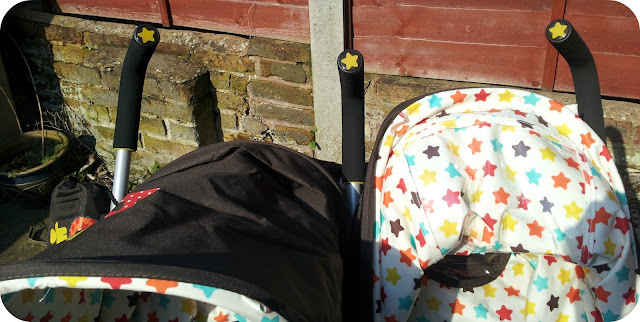 The stroller was easy to get through most doorways and didn't feel too wide to push at all. I did find that the seats were not as spacious as in a single stroller and Dylan looked and felt quite big in there. He is a very large 19 month old, and I am not sure how long the pushchair will last him. I found the foot muffs were not very big either and there was no way I could fit it on Dylan unfortunately which is a shame as I love the design. I think that Cosatto should consider matching blankets for bigger children as I would definitely pay extra for a matching 'big bro' one. 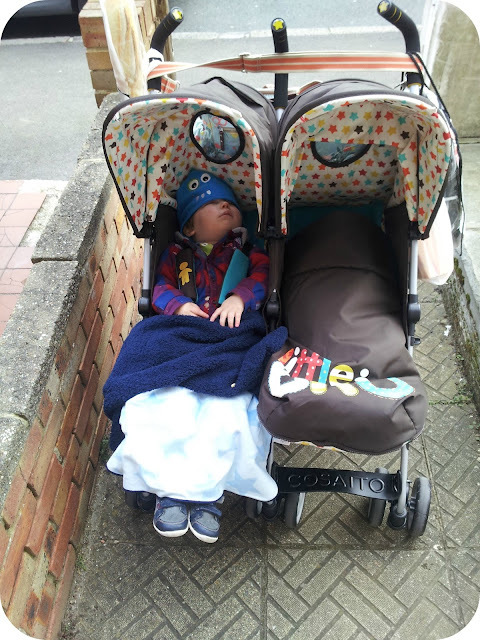 Dylan didn't seem to mind the size at all though and easily fell asleep in the stroller! Going out . . .
For Archie the seat was perfect. His head was well supported in the head hugger and he could lie completely flat. The foot muff kept him warm and protected from the elements and the generous hood kept the warm air in. The hoods have no clips to keep them in place but I found that they didn't need them at all and were very rigid when pulled out. Dylan loved being able to see his little brother and spent a lot of time leaning forward to check on his 'bubba'. He also loved the peep hole in the back when he was lying down and the additional hidden one in the top of the hood. 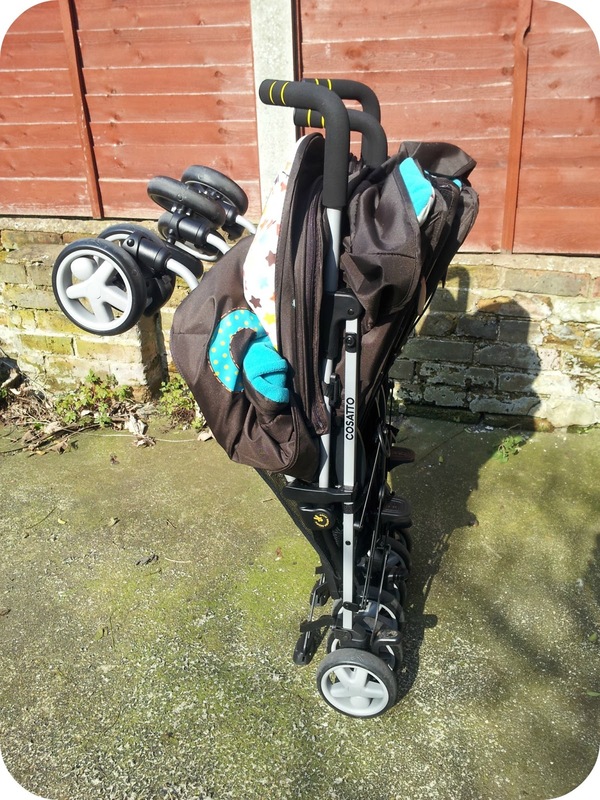 I was really impressed with the fact that the pushchair has several recline positions including flat and they were very easy to change independantly and one handed. 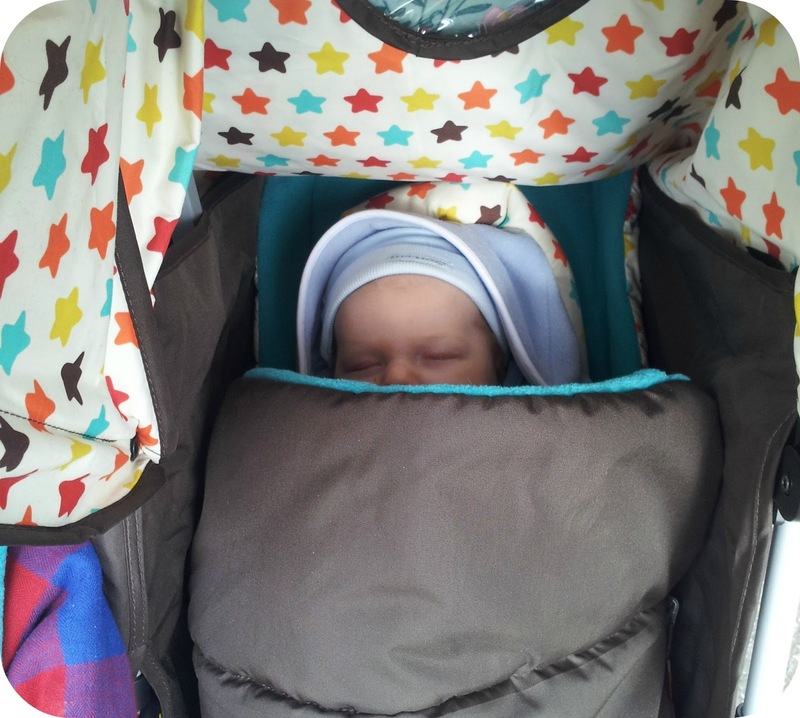 The hood has a hidden zip and when unzipped it offers a lot of protection from the elements and creates a lovely little cocoon for a newborn. We took the stroller out in the rain and I found the raincover a breeze to use. It was big enough to cover my pram bag on the back and spacious for the child. It folds nice and small and slots over the handles with velcro for the sides. I love the design and Cosatto really do seem to have thought of everything! 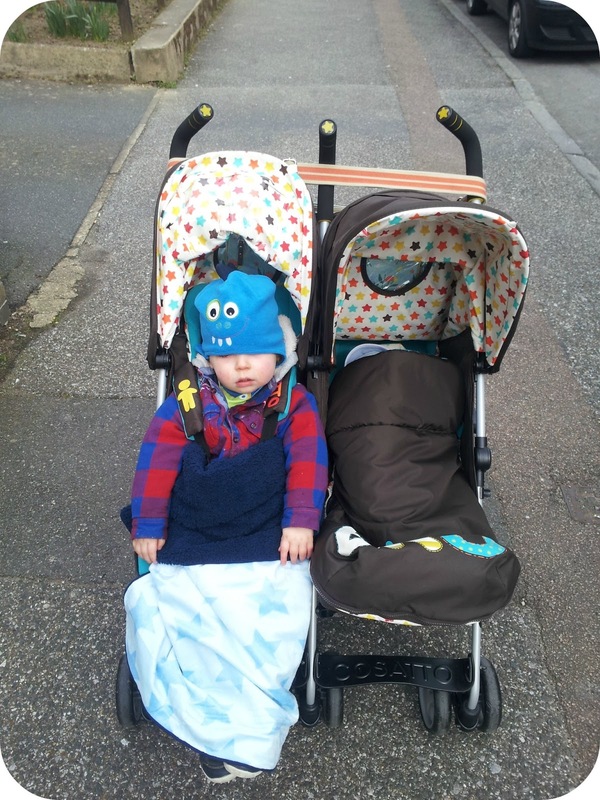 The bloke loves all the gadgets on the pushchair and that it comes with everything you could possibly need. My only real criticism is the seat and footmuff size for a larger child but as this doesn't seem to be bothering the little guy it is not stopping us using the stroller at all. 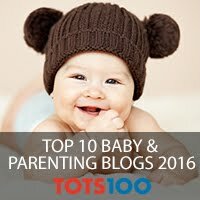 Disclaimer: I was sent the Supa Dupa free of charge for the purpose of this review but all thoughts, opinions and photos are completely my own. Great review. D does look big in it. I wonder how large Addy would be. Those hoods are massive. 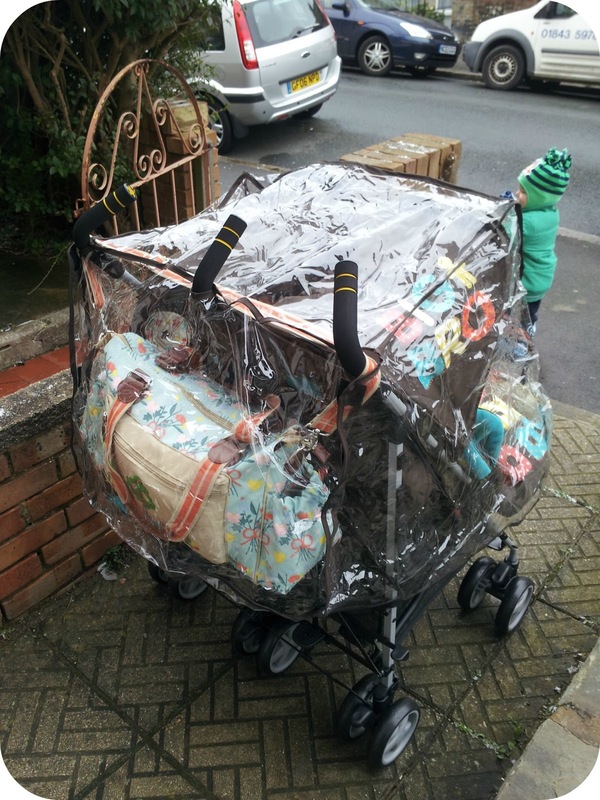 I love the hood its huge, my pet hate on buggies is small hoods. I always like the Cosattos for their cool designs too. 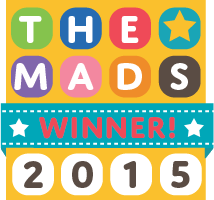 Love it, Cossatoo's are coming up with some fab designs.